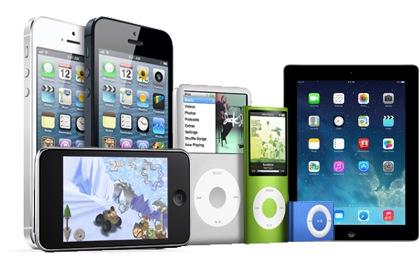 Find your iPad, iPhone or iPod runs slowly and slowly and wish to find a way to clean it? 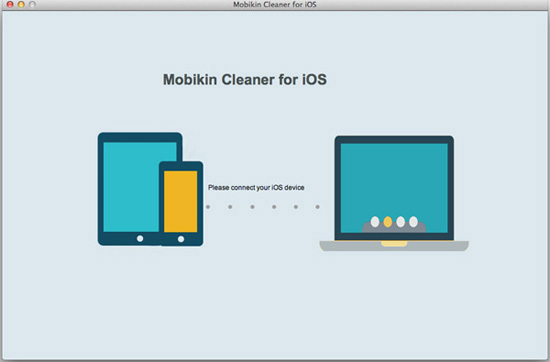 Then this MobiKin Cleaner for iOS (Mac Version) could be a great option for you. It is a simple and professional software that can help you clean all the junk files. Easily and quickly delete or wipe any unwanted data from your iPhone, iPad or iPod without hassle, including junk files, temp files, app crash files, log files, cookies, unused apps, etc. 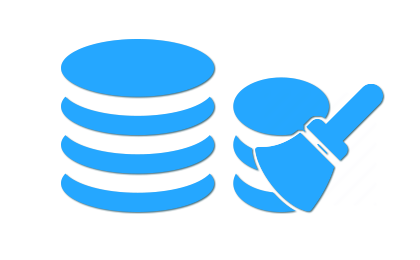 Without temporary and other junk files slowing your device down, you will notice faster and more efficient operation of your device, right? Just enjoy it! You may don't know that your iPhone, iPad, or iPod touch's storage space are always occupied by a large amount of hidden files, and you can't find and remove these kinds of files without any tool. So you have no choice but to find your phone's memory getting smaller until you have to delete something important on your device. Thus, in order to protect your privacy or personal files or speed up your iDevices, you need to delete these hidden files. That's why MobiKin Cleaner for iOS comes here as your assistant. After deleting hidden files on your iPhone, iPad or iPod touch, you can get a large amount of free space for downloading more apps or files according to your own needs. 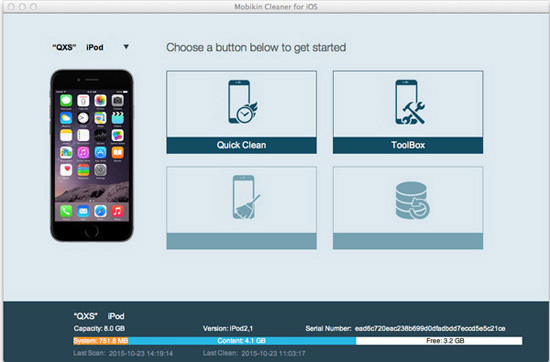 As one of the best iOS Cleaner software for Mac, this program allows users to conduct a quick scanning on the connected devices, and find all junk files on it at ease. The quick scanning mode can highly improve your working efficiency of cleaning data on your iDevices. After scanning, you have a chance to see the detailed list of the found files. And decide whether to wipe them at one time as you like. 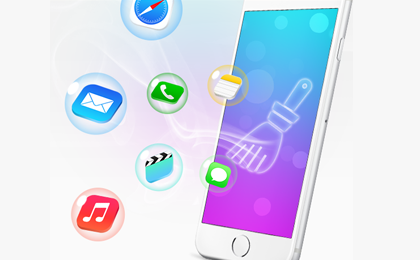 Users of MobiKin Cleaner for iOS (Mac Version) Have Surpassed 740,000+ Worldwide. The software has detected many junk files and I deleted them all. What amazed me was that the software free about 2GB space of my iPhone. Thanks to the software, my iPhone responded faster than before. What's more, it is free and that is the biggest reason why I love the software so much. It helps me free a lot of space of my iPad. Thanks to the software, my iPhone operate much faster now. What I want to say is that I think it is no necessary to select the files to be scanned because of course I want to clean all the junk files. Compared with other cleaning software, the program worked well. It operated quickly and it just costs me several seconds to clean all the junk files. 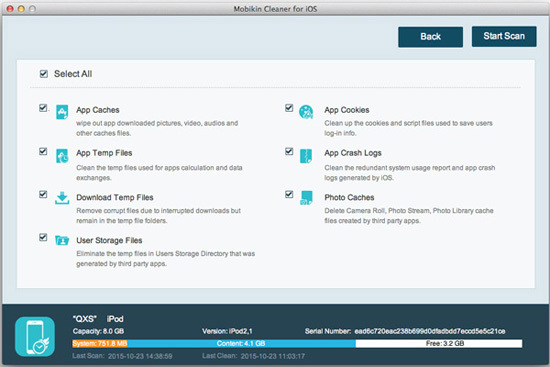 iOS Cleaner for Mac allows users to clean the junk files like app caches, temp files, cookies, crash logs, user storage files and so on with no hassle and in seconds. These junk data will be acumulated every time you use the phone and will occupy much space of the memory card. You are able to make a better use of your devices and just follow the guide below to free your iPhone, iPad or iPod. First of all, click the left icon below to download the Mac Version on your Mac computer. We also offer you the Windows Version here. Step 2. Launch the Software and Connect Your iPhone, iPad or iPod. Use a USB cable to connect the device to the computer and then lauch the software. The software will detect the connected device automatically and then you will see the interface like the below one. 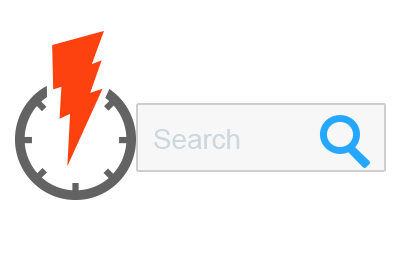 Next, select the "Quick Clean" icon when you see an interface like the below one. Choose files you want to clean and hit the "Start Scan" button in the right corner of the window. Choose the files you want to clean and hit the "Clean" icon to clear them all.